To help to overcome usual confusion.. and as a backup of previous posts. To be distinguished purposes, –> different/combined means. From the particular to the general, more or less drag&drop. 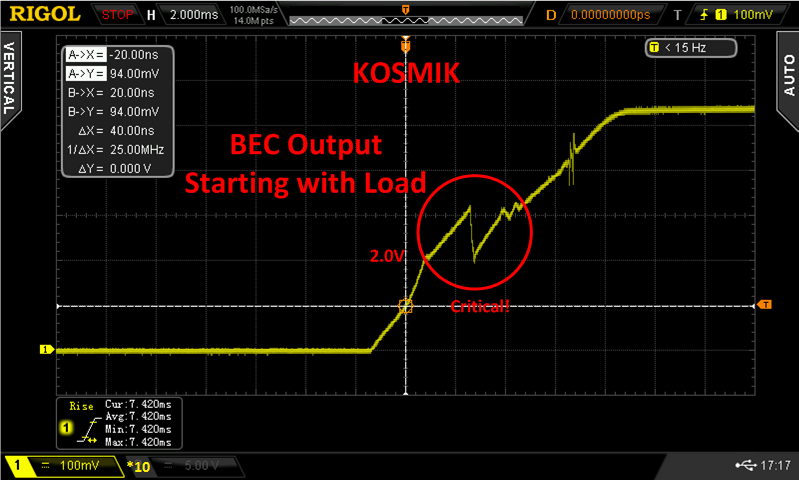 Around the BEC in a KOSMIK/JIVEpro is a design flaw: At powerup we have a race condition, a classical chicken-or-egg problem: The processor (MCU) has to control the output voltage of the BEC but it needs to be voltage supplied by that BEC itself. Now it depends on certain conditions if it will work at all and when it comes up, if without effects. One primary factor is the electrical load during the critical time. Critical time (after applying of battery voltage): If nothing wents wrong too much — after about 100ms the processor will be able to take control on the BEC (output voltage and regulation). The most critical time, the period of time in which it “decides” how it will proceed, is the first 10ms only. If it wents wrong it may need much longer time, in worst case the BEC voltage starts to oscillate (sawtooth wave), forever. That’s the point: Load. Investigation has shown that already 300mA can be too much. An R2buffer has electronics for delimiting the charge current flowing into the supercaps (and some other means). The charge current is adjustable, at max 700..900mA. Nobody will now delimit the current to <<300mA to avoid the BEC flaw to come into effect. It would need too much time until entirely discharged caps are full. Another problem on top may be that these electronics have minimum supply voltage requirements too. 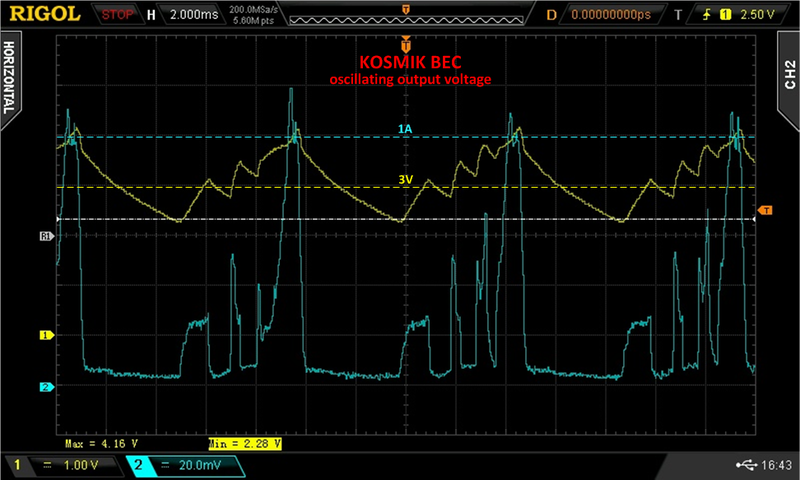 Investigation has shown that the BEC can drop below 3 volts, which is a critical threshold for most electronics. Comment: The manufacturer has NOT fixed the flaw. They use a workaround but they do not test it the right way afterwards. Also the environment temperature may can avoid the healing effect of that workaround. - Backup voltage connected to the output BEFORE powerup. This voltage takes the load away. An ideal diode behind the BEC ESC-internally avoids that current can flow into the BEC output. 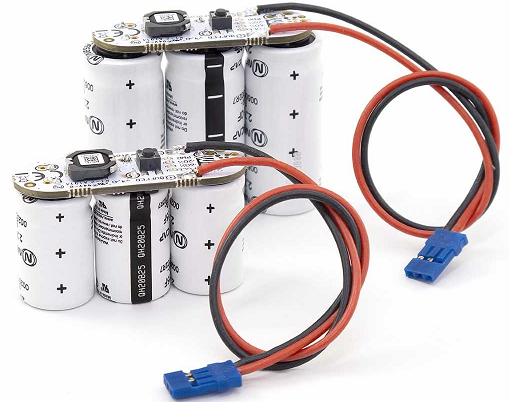 … Voltage source: battery, Opti Ultra Guard. - Opti BEC Guard: The Guard has many functions but one of it, the “voltage lockout”, acts automatically like the mentioned switch in the old JIVE. At least the critical 1st 10ms are load-free from the perspective of the BEC. - R2buffer: is almost the same as a battery in this case but w/ the lowest inner resistance of all possible means. - battery and Ultra Guard are about on par in this respect. A battery may be a bit better (depends..) than the “marginal” caps in the UG. - The BEC Guard only can protect. may simply connect a battery to the BEC output.